In April I delivered a talk on “Finding Faults in Old Virginia” as part of William & Mary’s Tack Faculty Lecture Series. Our study of Virginia’s faults is ongoing and one current project is focused on the boundary between the Blue Ridge and Piedmont regions. Virginia’s Blue Ridge Mountains are underlain by a sequence of antiquated rocks (some older than a billion years) that have been ensconced in North America for a considerable time. During the tectonic collision that created the Appalachians (~250 to 300 mya) bits and pieces of other continental blocks were accreted onto North America—today these exotic terranes are exposed in the Piedmont. 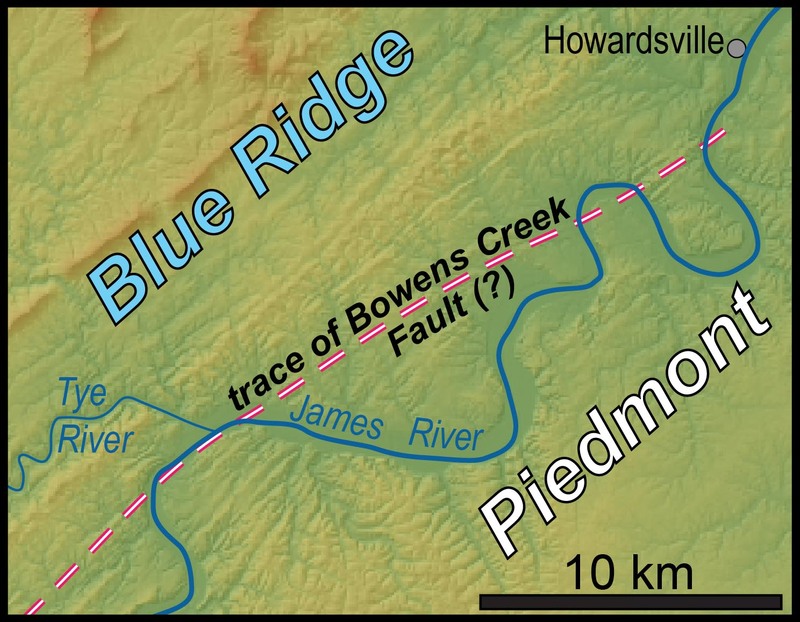 The boundary between the Blue Ridge and Piedmont geologic provinces is a fault: in northern Virginia, it’s the Mountain Run fault and in southern Virginia, it’s the Bowens Creek fault. In central Virginia, the structure that separates the Blue Ridge from the Piedmont is less clear. Some geologists posit the fault at the Blue Ridge/Piedmont boundary is a fundamental crustal boundary in the Appalachians, whereas others view the structure as minor and insignificant. Geologists also disagree about the kinematics (movement history) along this fault: some argue for reverse or thrust faulting, in which Piedmont rocks were shoved up and over Blue Ridge rocks, while others suggest faulting involved a wrenching movement – in which Piedmont rocks slid laterally past Blue Ridge rocks. Enter Parker Campbell, a William & Mary Geology major, whose senior research is focused on understanding the Blue Ridge/Piedmont boundary in central Virginia. Off to the field we went. But in the summertime, central Virginia is cloaked in thick foliage concealing the bedrock. 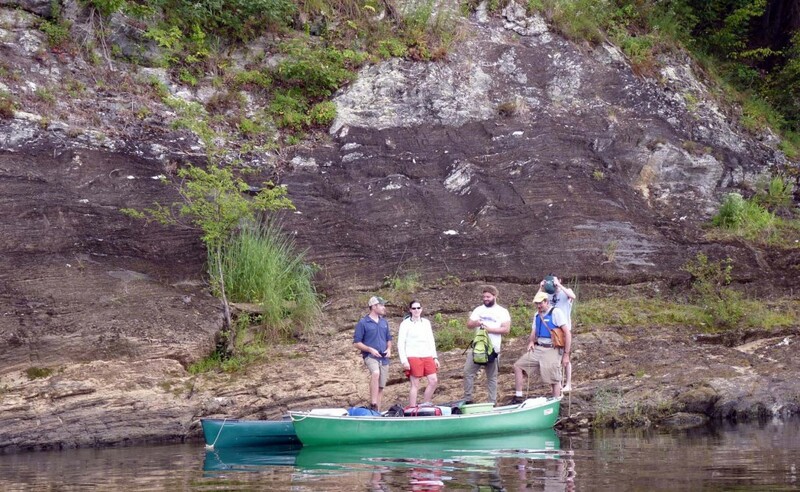 Rather than don full field gear to cope with the riotous vegetation, we took to the waters of the James River for a float trip to the outcrops. 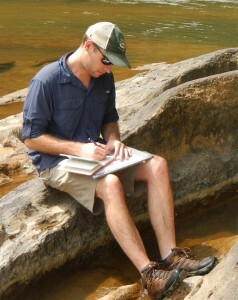 The James River does an effective job of eroding its bottom and margins such that bedrock outcrops are plentiful. Our flotilla of three canoes launched onto the Tye River on a pleasant morning. The float would take us 32 kilometers (20 miles) down the river to the little village of Howardsville on the James. We chose this stretch of river because, according to the 1993 Geologic Map of Virginia, we’d cross the trace of the purported Bowens Creek fault four times. Two kilometers (1.5 miles) into the float the Tye joins the James River and here we crossed to the cliffs on the southeastern bank. An exceptional set of outcrops rise steeply from the water and expose strongly deformed rocks—this is what we’d come for. Simplified map of the James River area in central Virginia with pertinent geographic and geologic features highlighted. This sequence of marble and schist is replete with asymmetric folds, boudinage, mineral veins, and mullions—all of which provide clues as to the rocks’ deformation history. We examined many outcrops on the two-day trip and collected a cornucopia of samples at riverside outcrops including marble, schist, quartzite, metagraywacke, quartzose phyllite and greenstone. We camped on a low sand bank in mid-channel and passed a warm evening with the waters of the James sluicing close by. Our stomachs enjoyed an eclectic summer menu of fresh and pickled produce. Good times, all in the name of research! On the outcrop, the field crew poses with part of the flotilla at the James River’s edge. Back in Williamsburg, Parker’s next tasks are to prepare a suite of petrographic thin sections for microscopic examination and sift through the structural observations to work out the rocks’ deformation history. 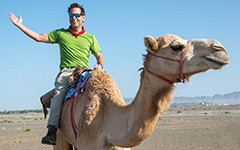 All William & Mary geology majors complete an independent senior research project—their efforts provide new and valuable data that help to answer an array of outstanding to longstanding geological questions and conundrums. I’m excited about what we observed in the field and am looking forward to collaborating with Parker as we work to understand the geologic history of this enigmatic fault zone.